There hasn’t been as much time to knit as I could wish this past week, but then again there never is. Nevertheless, I have been slowly plodding along on my Laresca. I have reached the point where I split for the armholes, after which I will knit the front and back separately. I am sure that it will look better with a pretty skirt and some sandals, and maybe an iced coffee in my hand, and some sunshine (though I fear that here in England the sun may never come out this summer). 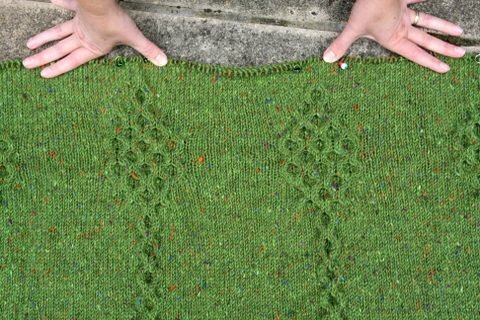 I have also been slowly working away on my Killybegs cardigan, and, lo and behold, I have also knit up to the armholes on this one. (Get it – I am up to my armpits in sweaters!). Here, I am trying it on for the camera, attempting to smile while awkwardly holding it up in place. Unlike my rather wishy washy feelings towards the Laresca, I love the Killybegs. I think it is fabulous. 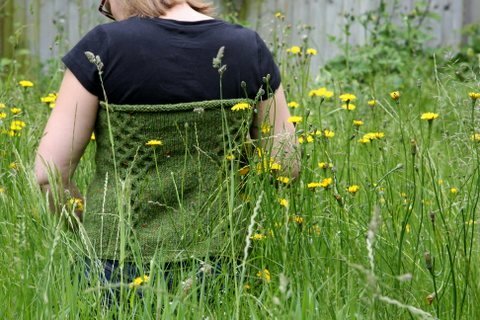 I adore the brilliant green, the sharp flecks of orange and blue, the unusual placement of the honeycomb cables, the shaping, the cozy, lofty, lovely wool. In short, I like everything about it. 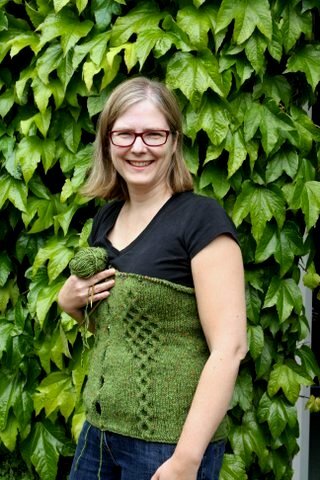 My only negative comment on this one, is that I wished I had put only four pattern repeats of the single honeycomb pattern, before branching out for the waist. 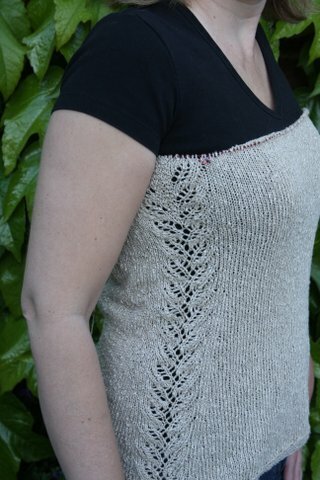 (This is through no fault of the pattern, but likely a combination of a slightly off row gauge and my natural shape.) As it is, I have knit the 16″ required to the armholes, but the waist of the cardigan sits above my natural waist. To correct this, I either have to rip out about 10″ and start the waist shaping earlier, or I have to make the cardigan a couple of inches longer. Can you guess which I will pick? Hopefully, long cardigans will be stylish this year. I have also been considering putting a zipper in this. The pattern has an I-cord edging on the front and hook-and-eye closures, but I rather think that a zip would be pretty nifty. I am not the best seamstress, and haven’t put in a zipper before, but I am leaning towards trying it out. What do you think? It has been a strange week around Knitigating Circumstances headquarters. Emma is still in Berlin, where she is sick. Doug has been in Malaysia, where he was sick, and is now in Brussels, where he is still sick. This leaves only Leah and me (thankfully, not sick) and the house seems very quiet. Thank you to Leah who very kindly took over Emma’s job as blog photographer this week (though we did send them out to Berlin for a final tweak!). 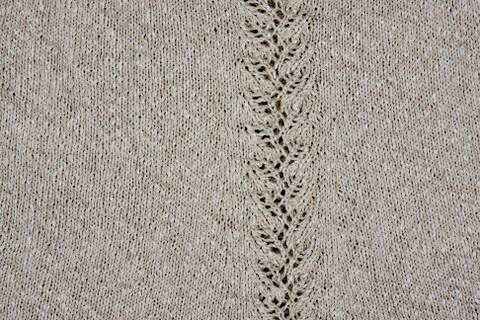 This entry was posted in Main and tagged Carol Feller, Corrina Ferguson, Donegal Aran Tweed, Killybegs, Knitting, Laresca, Rowan Panama by knitigatingcircumstances. Bookmark the permalink.